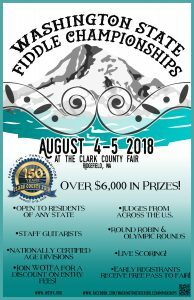 2019 Washington State Fiddle Championships at the Clark County Fair! We have hired phenomenal judges and staff guitarists from across the country! Over $6,000 in prizes! All ages and skill levels welcome! Once pre-registration is open (June), early entrants will receive a pass to the fair.